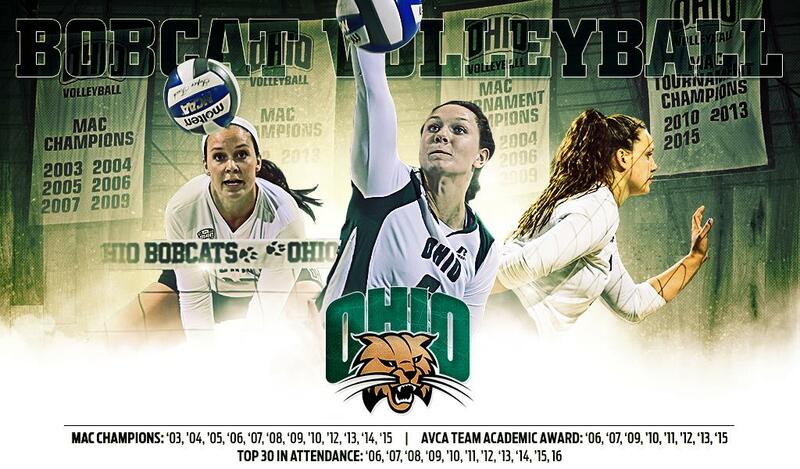 Join the Ohio Volleyball program this summer for our 2019 summer camps! We are happy to offer a variety of camps for players of every age and level of experience. There are camps for young players exploring the sport for the first time and for advanced college bound athletes. Each player will receive quality instruction from high level coaches and will receive feedback from current Ohio players to refine their skills. Ohio camps are led by fifth year head coach, Deane Webb and his staff. Camps are open to any and all participants and are limited only by number, age, grade level, and/or, gender. All cancellations must be received in writing via e-mail. Telephone cancellations will not be accepted. Cancellation requests must include the following information: Camper’s Name, Camp Name and Dates, Original Amount Paid, Reason for cancellation. All refund requests must be made to Ohio Volleyball Camp two weeks prior to the first day of camp: Email volleyball.camps@ohio.edu. There is a $50 processing fee for cancellations. Your credit card processing fee cannot be refunded. Campers are free to request their roommates. University housing holds 2 per room only. Camp staff does our best to comply with each of these requests. In the case that multiple people request the same group, we will room them next to each other. Campers should wear athletic gear (shorts/spandex, t-shirt, gym shoes, kneepads) each day. Camp T-shirts will be given out on the first day of camp. We ask that each camper brings their own water bottle. Campers can also bring any snacks they may need during camp. Overnight campers should bring sheets, blankets, a pillow, alarm clock, toiletries, and sweats/shorts to wear around the dorm in addition to their volleyball gear. What is Provided in my Dorm Room? University housing is air-conditioned and included two twin beds, a mini refrigerator and desks. Wireless internet will not be provided. Floor lounges include televisions, tables and chairs. Vending machines are available in most halls. Each floor utilized will have counselors monitoring the campers. Campers will be supervised at all times and are not permitted to leave their dorm location or campus area unsupervised Overnight campers will be supervised in the dorms by Camp Staff and Residence Hall Staff. Although, we do not anticipate this occurring, any misconduct could result in dismissal from camp without a refund. Overnight campers will check in at the Living Learning Center located at 111 S. Green Dr. Athens, OH. Commuter campers will check-in at the Ping Recreaction Center: 82 S Green Dr. Parking Passes for campers staying overnight with a vechile will be available for purchase and the number of passes will be limited. Parking is also available at a Pay-By-Space basis at the Ping Recreation and Baker Student Center. Is Ping Recreaction Center air-conditioned? Yes. The Ping Recreation Center is air-conditioned. Of Course! Parents are welcome throughout the duration of camp. For Living Learning Center: 111 S. Green Dr.
For Ping Recreaction Center: 82 S Green Dr.
From Michigan and northern Indiana, Cleveland and Akron area, North or West through Columbus: take I-270 around Columbus, OH, to the Southeast side. Take US-33 East, Exit 46 B, following US-33 E for approximately 68 miles from I-270 to get to Athens. Continue on US-33 East past Logan and Nelsonville for approximately 70 miles. After US-33 E joins US-50 W in Athens, take Exit 17, for OH-682 N. There is a traffic circle ("roundabout") at the end of the off-ramp. Traffic entering the circle must yield to traffic already in the circle, keep to the right as you approach the traffic circle, go one-quarter of the way around, and take the first exit, onto Richland Avenue; cross the Hocking River and enter the Ohio University campus. You will be at coordinates E-6 on the campus map, with the Convocation Center on your left and Peden Stadium on your right. From Southwest Ohio, southern Indiana or central Kentucky: take OH-32 E to Athens. If you are driving from the Chillicothe area, take US-50 E to Athens. Just West of Albany, OH, at the Ohio University Airport, OH-32 E and US-50 E join together. Continue East on OH-32 and US-50 for about nine miles. Take Exit 17, for OH-682 N. There is a traffic circle ("roundabout") at the end of the off-ramp. For the main campus, keep to the right as you approach the traffic circle, go one-quarter of the way around, and take the first exit, onto Richland Avenue; cross the Hocking River and enter the Ohio University campus. You will be at coordinates E-6 on the campus map, with the Convocation Center on your left and Peden Stadium on your right. From Northeast Ohio area: Follow I-77 S through Marietta and into West Virginia. Stay on I-77 South, approximately 4 miles past WV-2, to US-50 West. Stay on US-50 W from Belpre to Athens. Stay on US-50 W all the way up the Hocking River valley to the city of Athens. After US-33 E joins US-50 W in Athens, take Exit 17, for OH-682 N. There is a traffic circle ("roundabout") at the end of the off-ramp. Traffic entering the circle must yield to traffic already in the circle: For the main campus, keep to the right as you approach the traffic circle, go one-quarter of the way around, and take the first exit, onto Richland Avenue; cross the Hocking River and enter the Ohio University campus. You will be at coordinates E-6 on the campus map, with the Convocation Center on your left and Peden Stadium on your right. From Port Columbus International Airport: A shuttle can be provided for players arriving at Port Columbus to and from campus if they are flying without a parent or guardian. This shuttle is free of charge. Please contact a member of our staff directly if you are in need of shuttle service.